Rami Jeridi showed great reflexes in the 63rd minute to save what would have been an own goal from Chamseddine Dhaouadi who’s attempted clearance from a Lorch cross went the wrong direction. I think my players came here with an intention to get good results and I think we played very well. 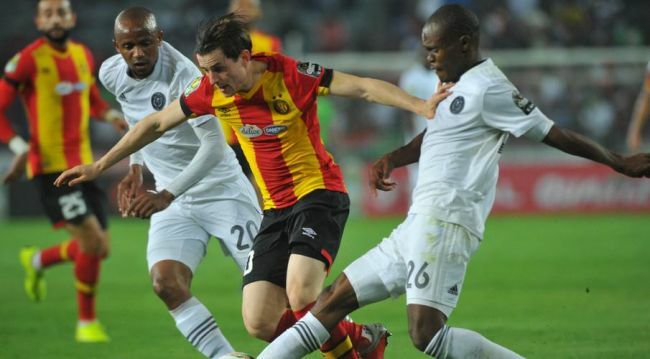 We find ourselves in a group whereby three teams have an equal chance of going through to the quarterfinals: Esperance, Orlando Pirates and Horoya. I’m very happy with my players and I’m happy with our performance. Tactically, they were very difficult. I think they (Orlando Pirates) have some good players. We came to this game having played some very difficult games including a semi-final back home whereby we played almost two hours. But I’m happy about how we played and managed the match. Orlando Pirates is one of the biggest teams in Africa. You will remember that a few years ago they went to our stadium and got results. This game was like playing chess; it was a very tactical game of football. There was a period whereby we had three against three in the midfield and we kept on moving around and chasing each other. We played a very good team. They knew us, we knew them and you could see they planned for our strong points. I think we created chances but not enough. It is a bitter feeling because we played very well against a very good team but we couldn’t score. The goal alluded us. We have to go back and plan. We have to focus for the next game in Tunisia. I know that the conditions will favour them in Tunisia including the weather and the field conditions. We have to prepare well for the return leg. It is not about home and away but points. Our aim is to finish amongst the best two teams in our group.